I took my time getting packed in the morning to give my boat repair a little more time to cure. The wind was still light on the short paddle to Ice Harbor Dam. I had put the boat cart together before launching so all I had to do was slide the cart on and I was off. I had good cell coverage at the dam. We often forget there are huge areas of the world beyond the reach of cell towers; most of my route from Lolo Montana to this point for example. There were many vineyards along the river now, along with all the orchards. Very pretty country. A few miles short of the Columbia River I was surprised when my phone rang. It was another old smokejumper buddy, Jon Larson. He and Randi Jandt were driving through Pasco, he said. Was I by chance in the area? I said I’d be there in an hour! What a coincidence. They were waiting for me at Sacajawea Park. It was great to see them. As we were talking my hiking buddy Chris Hansen drove up. That rendezvous had been planned. The four of us drove to a restaurant for lunch. What a fine group of people. We said goodby to Jon and Randi. Chris drove to his place where I got a shower and did laundry. Next I picked up a few groceries for the next stretch of river. 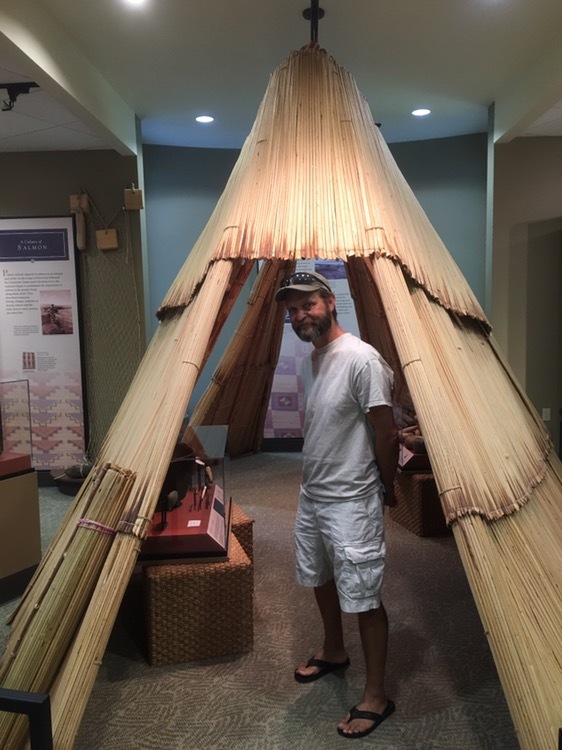 Chris and I later toured the museum at Sacajawea Park. Very interesting displays about the Corps and local tribes. 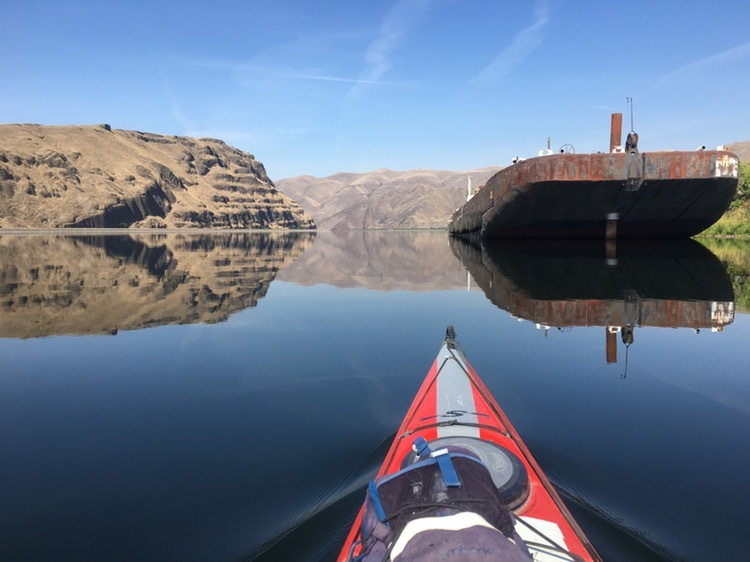 I loaded my kayak and thanked Chris, then paddled onto the Columbia River, a much bigger river than the Snake. I paddled about seven more miles before finding a good camp site just before dark. 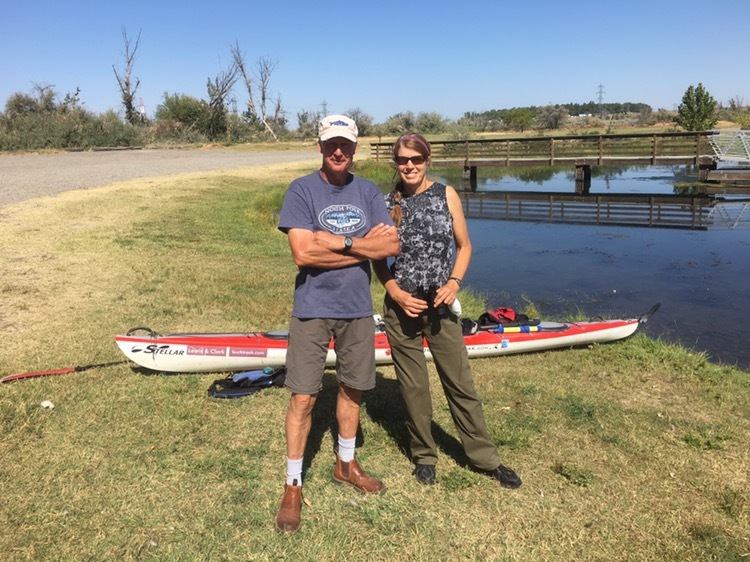 August 29-30 Days 159-160, 336 Miles to the Pacific! Early in the morning I heard a thump outside my tent, a jumping mule deer. I slowly stuck my head out and saw a mule deer buck and doe walking across the hillside. The wind was giving me a break early on, with another orange sunrise. The low morning light made the relief of the brown basalt cliffs even more dramatic. This has definitely been one of the most scenic stretches of the Lewis and Clark Trail. As I approached Lower Monumental Dam a big tour boat was just coming out of the lock. At the boat ramp I put the cart on and wassoon rolling along the road. I couldn’t find a very good way back down to the river but finally wheeled between two boulders and over some smaller rocks to the water. I stopped to eat some blackberries and later spotted a huge dead sturgeon that must have been nearly 5 feet long. I rounded the corner and spotted the dock for Windust Park where I was going to get water. A guy sat on the dock with two chairs and two beers. It was Rod Dow, one of my old smokejumper buddies. I was truly surprised. I’d had no idea he was coming. Rod brought me ice cream, a cheeseburger, peaches and a list of food far to long to mention, with a whole bunch of food to send with me as well. We drove into Kahlotus for dinner and so I could access Wifi to update my journal. There was some epic story telling that afternoon and evening, although at one point he claimed I was telling one of HIS stories. Regardless it was a genuinely good time. We smokejumped together for twenty years. Thank you Rod! I got an early start, hoping to make it to Pasco today. The basalt bluffs continued but as the day progressed the were getting lower in places and in others moving farther from the river. Orchards were now visible, along with more irrigation. I heard some workers yelling back and forth and the sound of loud Spanish music. A barge went by. I’m surprised, though, at how little barge traffic I’ve seen on the Snake. There seems to be a lot more stuff moving along the railroad track that is usually closely following the river. I seemed to be sponging out more water than usual. Each time I get in and out of the boat considerable water runs off my pants and shoes. I was slightly concerned that the crack from below Great Falls had split again, despite my faith in the epoxy repair. I found a gravel bar and flipped the boat over. The crack had broken open. That was dispiriting. I had more epoxy, but a repair should cure at least 12 hours, preferably 24. If I had only noticed yesterday when I’d taken most of a sunny day off! I found a better landing place and flipped the boat over to dry in the sun. Luckily there was great blackberry picking there. When the boat was dry I got out my roll of white duct tape and made a temporary repair. When I launched I made sure not to drag that part of the boat on the river bottom. When I got to Charbonneau Park it was still only about 2 PM but I’d already come 27 miles. I decided to do the repair here, cutting short my big day. It took a while to figure out where I should or could camp. I unloaded my kayak and set it up on a picnic table, mixing the epoxy before making the best repair I could, inside and out. There was a weak cell signal but I still managed to get through to my parents to wish my Dad a happy birthday. My campsite was in a quiet corner of the campground. I was tired and fell asleep early. 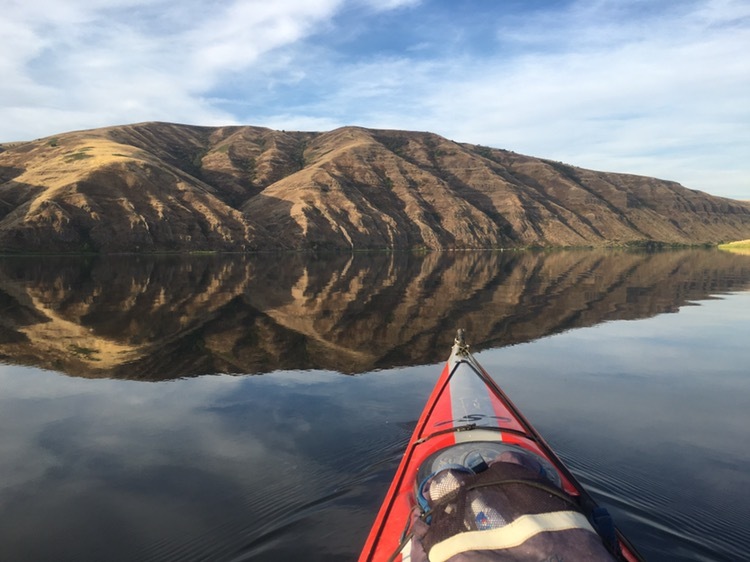 The morning of August 26 I paddled out of Clarkston and out into a windless day onto the smooth waters of the Snake River. The day before, the 25th, had been a great rest day, one day of those rest days when I didn’t need to rush around doing a whole bunch of chores. I went to a taco place for brunch, and then when straight across the street to Arby’s for some sandwiches to go. They were for tomorrow so I put them in the fridge. The 26th I picked up the Lewiston paper and found that the article about my adventure had appeared. Usually articles about topics I know well are loaded with errors. This one was remarkably accurate. I could have explained some things better, but that’s part of the game. Much of the day was quite calm, with nice reflections of the impressive bluffs. From time to time I’d stop to pick blackberries. Some patches were far past their prime, some were loaded, regardless, I got all I wanted of the big, sweet berries. At one stop I saw a baby muskrat. He let me paddle right up to him while he ate and swam around. He was very cute and bold. It was evening when I got to the Lower Granite Dam portage. Several mule deer had come down to feed, including two bucks. I was soon rolling my kayak down the road. There was no put-in site below the dam. It looked like I was going to have to go nearly three more miles to the next boat launch! Ouch. Soon though, I was surprised and happy to see a portage sign. There was a nice flat area of round gravel well above the water. I layer my tent down and out my inflatable mattress on top. I’d come about 32 miles. Not a bad day for a late start and virtually no current! I slept great. It had been cool and mosquito free, with bats flitting against the stars. It was still well before sunrise when a light swept across my camp. What was that? A few minutes later I heard big engines. A big well-lit boat worked its way upriver. A paddle wheeler! That was a surprise. Not far downstream was a campground full of sleeping people. 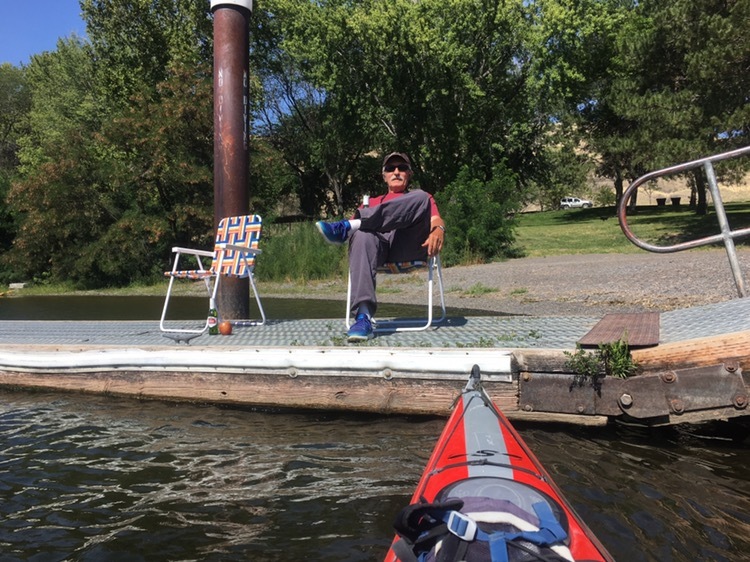 I filled up my water bottles there then paddled steadily for a long time. I saw chukars along the shore, as well as a nice flock of wild turkeys. I heard quail and a pheasant. There were plenty of ospreys and cormorants as usual. I’d put in about 13 miles when the predicted strong headwind came up. I landed and found a place out of the wind and in the shade. After putting out the solar charger to charge my phone I began reading a book. It was a good book and a comfortable spot. I read for hours as the whitecaps rolled upriver. Twice it looked like the wind was dying and I launched, but then had to land again. One landing had bushes sagging with blackberries. I shared them with scores of wasps without incident. At the end of the day I managed to paddle to a nice flat area with a nice sandy place to land. There I set up a comfy camp having made about 17 miles. On orange sunset illuminated the clouds all across the sky while mule deer fed along the ridgeline. Incredibly my pants dried overnight. I was paddling soon after first light with a nice orange dawn rising behind me. The scenery was outstanding all day long, with basalt cliffs on each side, hills that were blocking my ability to update my journal or call my Dad for his birthday. One barge went by upriver, one of the few I’ve seen. In places there were giant grain bins, most with one giant cone of grain beneath a towering auger. What happens when it rains? I arrived at the Lower Goose Dam portage. This was a busy place on a Sunday. There were a number of people camping there and boats launching for water skiing and fishing. I wheeled my boat over the dam and to the turnoff to the visitor’s center. I stashed my kayak there and walked down to the fish viewing building. It had been a big thrill to arrive here when I hiked the Desert Trail in 2012 I’d been mostly in a desert world. Seeing the Snake River and the salmon swimming past the viewing window had been really fun. I got a kick out of seeing the fish this time as well. 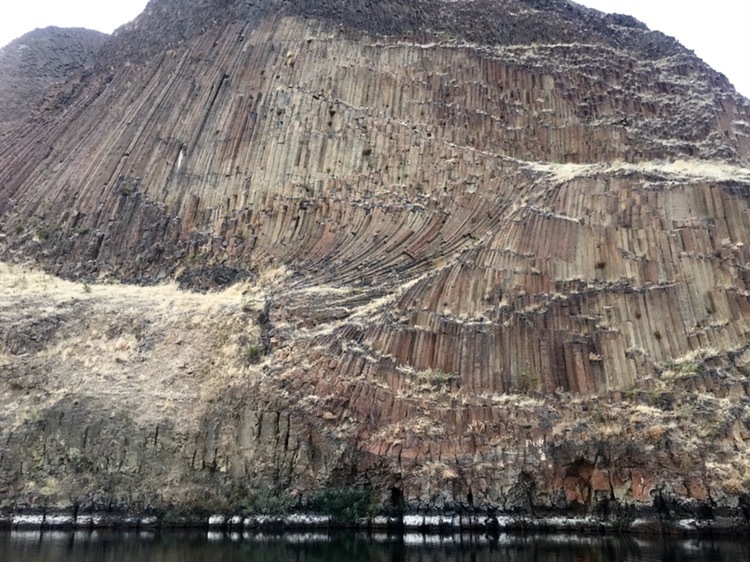 Towards evening there was an amazing formation of vertical basalt “posts” at varying angles. Had it been at a national park it would be famous. I found a side bay to camp in. A flock of quail flew up from the nearby willows. A coyote trotted up the sage hillside and watched me as long as he dared. A porcupine looked up from the willows, trusting to his quills.